Mississippi Supreme Court Chief Justice Michael K. Randolph signed the order appointing Judge Barnes as Court of Appeals Chief Judge before a large crowd in the En Banc courtroom in Jackson before he administered the oath of office. Chief Judge Barnes recognized in the audience former Judge Mary Libby Payne, the first woman and one of the original judges of the Court of Appeals. Others who inspired her included Supreme Court Chief Justice Lenore Prather, the first woman to serve on the state’s highest court and the only woman Chief Justice, and the late Lt. Governor Evelyn Gandy. She expressed thanks not only to women of the state’s highest offices, but to women such as Jean Magee, the first female lawyer hired at the law firm of Mitchell, McNutt and Sams in Tupelo. Magee’s example of hard work helped open the way for Barnes to become the firm’s second woman lawyer. Exemplary trial judges including Denise Owens, Patricia Wise, Jacqueline Mask and Sharion Aycock influenced voters to consider electing other women judges. Chief Judge Barnes said that Phillips’ example as Mississippi Bar President in 2005 likely influenced members of the Bar who recently elected a fifth woman, Jennifer Ingram Johnson of Hattiesburg, as President-Elect of the Mississippi Bar. Wicker noted that Judge Barnes, who grew up in Natchez, was a Girl Scout, choir member and musician. She played baritone in high school and in the Ole Miss marching band. 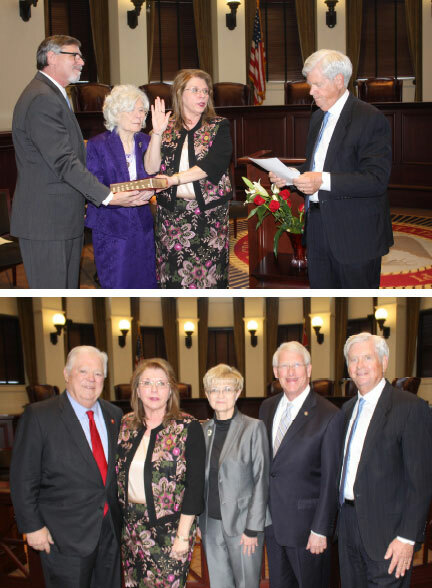 Watch the archived video of Chief Judge Barnes' investiture at this link: https://livestream.com/supremecourtofms/Swear-in-Chief-Judge-Barnes.